There's been a lot of visceral (read: ICK) reaction to the stomach-draining device that was just approved by the FDA. An alternative to traditional dieting and more invasive than traditional bariatric surgeries, the AspireAssist system is definitely a new way of preventing calories from being absorbed by the body. There's been a lot of visceral (read: ICK) reaction to the stomach-draining device that was just approved by the FDA. An alternative to traditional dieting and more invasive than traditional bariatric surgeries, the AspireAssist system is definitely a new way of preventing calories from being absorbed by the body. This device is being dubbed a "bulimia machine," and the ick factor is definitely huge. 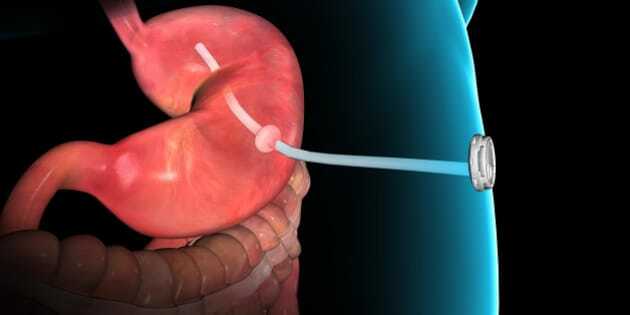 AspireAssist is essentially a thin tube implanted into a person's stomach. Twenty to 30 minutes after finishing a meal, the user attaches the tube to an external device, which pumps the top 30 per cent of the stomach contents into the toilet. The reasoning is simple: if the food isn't in the stomach, the calories from the food aren't absorbed by the body, and the user loses weight. The FDA reports that in clinical trials, AspireAssist users lost 12.6 per cent of their body weight in one year using the AspireAssist versus 3.6 per cent for a control group. As a point of comparison, people who have traditional bariatric surgery typically lose over 30 per cent of their body weight over the first year after surgery. The reason why people are freaking out a over AspireAssist is because it really seems to mimic binging and purging. The rate of obesity in the world has doubled since 1980, with more than one-third of U.S. adults considered to be obese. Now, I quote this statistic with a grain of salt, because they do use the faulty BMI as an indicator. However, I think we can all agree that there are a great deal of people who need assistance to achieve an ideal weight for THEM, and that the weight that they're at right now may put them at risk for health problems. Bariatric surgery, whether you believe in it or not, is not going away anytime soon. It's not a secret though that many people regain weight (and here) post bariatric surgery, but it continues to be a very in-demand procedure. It's not a shock that an enterprising company has thought up an alternative like the AspireAssist. The AspireAssist website reads like a slick PR campaign. There are a lot of mentions of "quick!" and "go shopping for new clothes!" and "your transformation." Hm. This sounds like a walk in the park! Fun! But really? The AspireAssist is implanted into the top part of the stomach as a safety precaution -- so once the top 30 per cent of the stomach is drained, the device shuts off, unlike typical purging methods, which typically empty the entire stomach, or gastric bypass, which creates a smaller stomach. I get this, but what happens if someone continues to eat after using AspireAssist? Theoretically a person can drain, eat, drain, eat. They can also fill the lower 70 per cent of their stomach with low-calorie foods that are bulky -- such as raw vegetables -- and then use the top 30 per cent of their stomach space for more caloric foods. AspireAssist recommends aspiration 20 to 30 minutes after food consumption happens, but users can use the device before that, ensuring that the stomach won't have time to thoroughly mix its contents, making it pretty easy for someone to get rid of whatever food they choose to eat last. After all, the stomach is a first-in, last-out sort of organ. As long as food is chewed really well (so it fits through the 6mm tube) -- it will end up in the toilet if you aspirate right after eating. So, this device safety measure seems to have a work-around. You have this work-around with traditional bariatric surgery, too, because theoretically a person can easily overeat by simply eating, vomiting, eating and vomiting, or eating many small, high-calorie meals throughout the day. The difference? AspireAssist is definitely easier in terms of purging. No tooth decay or esophageal erosion from vomiting. No vomiting at all. Pssst... wanna buy an AspireAssist? The AspireAssist stops working after 115 cycles, or approximately five to six weeks. The user then has to see their doctor to get a replacement part for the device to make it work again. This is a great safety feature, if all health care professionals were reputable. It may be a bit of a stretch, but how long do you think it's going to take before a black market for AspireAssist parts and servicing exists? Also, just like there are a number (unfortunately) of physicians willing to overprescribe narcotics, do you think that there will be the same issue with the AspireAssist? It's worth a thought. It's totally congruent with society's "quick fix" mentality that demands a fast and easy solution to all of our problems. Is it an eating disorder assist? Thanks, FDA, but how about those people who have undisclosed or undiagnosed eating disorders? And how do they define "eating disorder," because I'd argue that most people who need AspireAssist actually do have an eating disorder. Overeating is as much of an eating disorder as anorexia nervosa or bulimia. So, how does AspireAssist help or harm these people? It costs a lot, but who cares? The AspireAssist will cost $8,000 to $13,000, plus procedure costs. I don't think for a second that this will deter people who are hell-bent on getting it. This is one of my biggest issues with AspireAssist. Unlike traditional bariatric surgery, the AspireAssist can be placed as an outpatient procedure and the user can be home in two hours. This is concerning to me, because it's totally congruent with society's "quick fix" mentality that demands a fast and easy solution to all of our problems. Weight loss isn't fast and easy in cases like these. The issue with both weight-loss surgery and AspireAssist? They're Band-Aids that don't address the actual cause of chronic, consistent overeating -- which we know rarely has anything to do with food. Interventions such as these should be starting points for people's weight-loss journeys, and not an end point. Intensive counseling -- not just for nutrition, but for WHY a person has eating issues -- should be mandatory prior to and during any bariatric intervention. AspireAssist talks about "lifestyle counseling" that addresses some of the emotional reasons for overeating. I'd like to learn a bit more about who will be providing this counseling and what it entails. Overall, I think the AspireAssist, more than traditional bariatric surgery, is far too easy to use without putting the responsibility on the user to make better choices and to learn about satiety and hunger cues. It has some concerning work-arounds in its safety measures, and I feel like it oversimplifies the weight-loss process by focusing on the "quick and easy" aspect and downplaying the true cause of overeating.